Home » The Best Budget Espresso Machines – Espresso for the Rest of Us! The Best Budget Espresso Machines – Espresso for the Rest of Us! 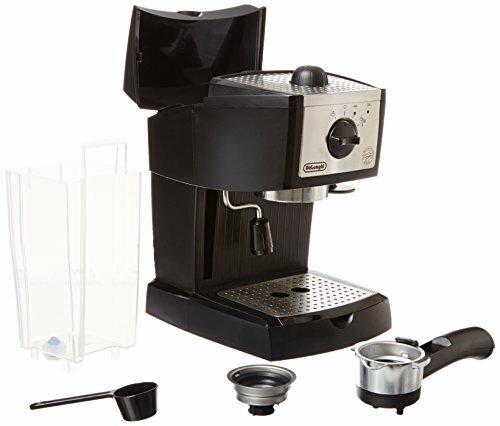 For those of us for which $200 is a paycheck and not disposable income, here’s a breakdown the best espresso machines in your budget. Alright, so you want to buy a good espresso machine in a budget. But where to start? The Internet, sure, but that can be a bottomless pit of confusion. You need a guide. A Virgil to your Dante. A Gandalf to your Frodo. A Wayne to your World. Turns out, I am just the one for the job. With years (too many years) of barista and professional coffee experience, I am certainly qualified to find that perfect machine for you. In order to give a blanket judgment on this, I made up a test using two different espresso blends of opposite quality (one very good, one not so good) and let the machine do the rest. It’s cheap. Think about it this way. It’s about the price of one week’s worth of coffee shop espresso. And you don’t have to deal with that barista with the weird beard that he can’t even bother to condition. For the latest prices and discounts. Aesthetically, it’s fine. It looks like a simple home espresso machine. But size wise it’s perfect. Measuring in at 8 x 6.5 x 10.5 inches, it fits easily on most kitchen counters (even yours New Yorkers), and could easily be tucked away in a cabinet for storage. All of the parts fit handily together for easy storage and a clean simple look. Listen, it works. But it takes a minute to figure out how. I recommend taking that time or else it’s going to feel like you’re trying to hack Norad. I don’t actually know what that is in reference to, but I think it’s hard to do. My point is, there are many tutorials online (both text and video), so do that. Otherwise, it can super annoying and frustrating. Also fairly easy to clean, which is good. Because a machine at this price point will break down fairly quickly without regular cleaning. Even with my foolproof testing plan, it’s really hard to tell. So, average. It produces drinkable espresso on a fairly consistent basis, and honestly, that’s the bottom line. It has a steam wand, and comes with a glass decanter, portafilter, and an inappropriately sized tamper. Basic. Basic. Basic. Checking in as the cheapest espresso maker on the market, you wouldn’t expect this to do anything special. And you’d be right. It’s incredibly basic. And not in a pumpkin spice latte kind of way. If price is the most important thing for you, then go right ahead and make it happen. You will not be disappointed. Sleek, stylish, and just pretty. I MEAN LOOK AT IT. Coming in at 13.2 x 10.2 x 13.5 inches, it will absolutely fit on your countertop. And you will be happy it’s there. Okay. I may be overstating this a little, but I like the way it looks. Gotta problem with that? You may start to sense a theme, but you have to learn how to use it. It’s not so simple that you just plug it in and press go, but simple enough that a quick read through the manual will absolutely suffice. And as luck has it, it comes with an actual instruction guide. My favorite thing about this machine is the removable water reservoir in the back. It makes for easy filling, as well as easy cleaning. 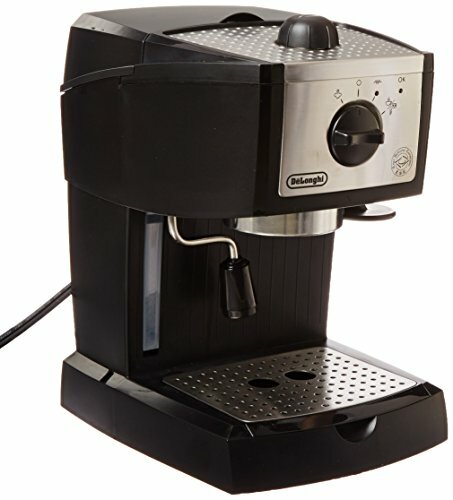 The marketing for this machine proudly boasts that you can use espresso pods (single-serving prepackaged espresso), but honestly, it doesn’t quite work the way you want it to. This is more of a functionality issue, but it if you bought this machine because you love the taste of espresso pods, you will be disappointed. But overall, it definitely passed my super scientific taste test. Very straightforward, nothing too fancy. This is my favorite of the bunch. It’s a machine that will make your friends jealous, and will get caffeine in your face quickly and tastily. If your main priority is ease of use, this is the machine to go with. No magic needed. I would like this bad boy to be a little sleeker. The “Mr. Coffee” branding seems to me to be straight out of the early 2000s label craze, and is purely there for the brand loyal consumers out there. I also worry about how that automatic milk frother container will look after a couple weeks of use. Yes, you will clean it, but the residue of the proteins that are released during heating of the milk will eventually take its toll on any clear vessel. Maybe this is just a me problem, but I don’t want a machine that I’m going to have to hide when company comes over. Especially one as bulky as this (12x14x12.2 inches). This is where this guy earns its stripes. The word automatic is associated with almost every part of this machine, and it couldn’t be easier to use. Take a quick glance over the parts, read the instructions, and have at it. My favorite function is that the machine will automatically turn off a few minutes after use. This is great for the absent minded, but really, you haven’t had your coffee yet. How can you remember to do anything? Good stuff. I guess the branding isn’t just a trick. My assertion is that if your last name is “Coffee” you better be able to produce a quality cup. And this one does. You would expect a higher price point machine to include more bells and whistles and you’d be right. This very much plays into the functionality of this machine, but by taking the guess work out of the milk frothing (it’s automatic), you are saving yourself a lot of heartache and wasted milk. Additionally, the product description boasts a removable water reservoir, an adjustable drip tray for different size cups, and a simple one touch interface for drink selection. It doesn’t come with your very own in-home barista, but I imagine that could be arranged. 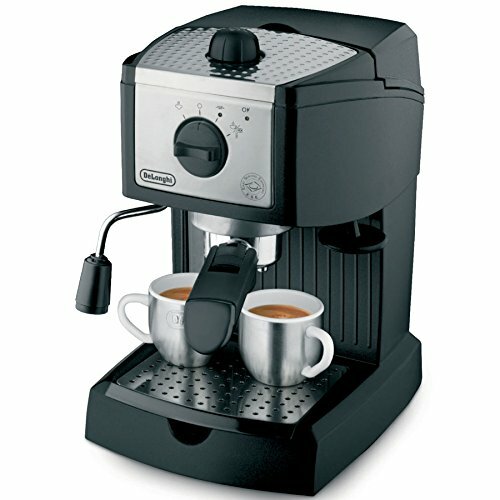 Our first choice is the De’Longhi, a quality budget espresso maker from a big name brand. This is a semi-automatic espresso machine that features an in-built manual steam wand, which means you can enjoy espressos and Americanos, in addition to the full range of milky drinks (latte, cappuccino, and macchiato, etc.). The frother benefits from a swivel function, making it easier to get the right texture of milk foam. Pre-Ground or Single Use: One of the advantages of the De’Longhi is that you can use either pre-ground coffee or ESE (single use) pods. In fact, the machine comes with a three-in-one filter holder, to accommodate a single espresso shot, a double espresso shot, and pod coffee. Simple Operation: The machine is operated using a simple front-mounted dial (for steam, heat-up, and hot water). There is also a separate control for the steam wand. Excellent Quality: The overall quality of the espresso is very good, with nice crema. If you use freshly ground, good quality coffee, you should be very happy with what the De’Longhi can produce. Quick Heat Up: The machine has a quick heat-up time, thanks to De’Longhi’s self-priming feature. Good Capacity: The removable 35oz water tank is big enough for around 8 to 10 espressos before it needs to be refilled. Maintenance is pretty straightforward, with the removable water tank and drip tray. As with all coffee machines, the De’Longhi will need periodical descaling (and don’t forget about cleaning the milk frother wand). May Need some Accessories: If you want to make use of the in-built frother to steam milk, you will need to invest in a suitable pitcher. The best choice is a 120z stainless steel pitcher, which can be bought for less than $10. You might also like to invest in a 50-52mm heavy duty tamper. There is an inbuilt plastic tamper, but for brewing the best quality espresso, a heavier metal one is best. In addition, it’s a good idea to buy some espresso shot glasses or demitasse as the cup clearance height is quite low. Alternatively, you can remove the drip tray for extra cup height. Manual Operation: Negatives points include the fact this is a manual operation machine, which means you have to switch off the water following the extraction process or it will keep forcing water through the coffee. The machine also sits quite low on the counter which makes operation and milk steaming a little awkward. 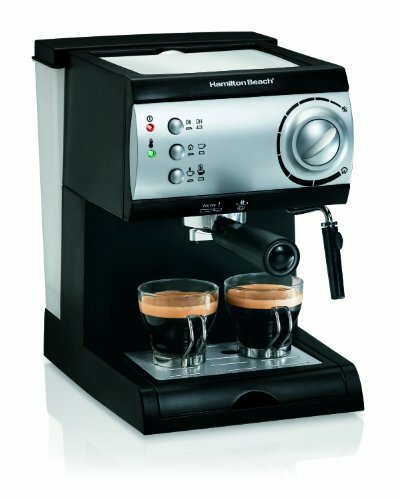 Our second choice retails at around the same price as the De’Longhi and offers many of the same features. 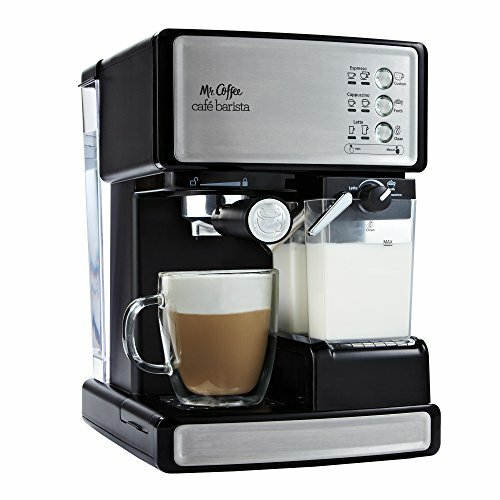 The pressure is the equivalent 15-bar pressure pump system and the Mr. Coffee features an independent frothing arm for steaming milk. Manual Shut Off: This machine also has the manual water shut-off system, meaning it won’t stop automatically once the espresso has been extracted. With budget espresso machines in general, it’s this type of reduced functionality that sets them apart from the higher end of the market and puts them within reach of many more home brewers. Still Needs Some Accessories: Again, for making lattes and cappuccinos, you’ll need to buy a 12oz stainless steel pitcher for steaming milk. A plastic tamper (with combined coffee measuring spoon) is supplied, but for optimum results, it’s a good idea to invest in a quality metal 50-52mm tamper. A Few Key Differences: When comparing the De’Longhi and the Mr. Coffee, there are a few differences of note. 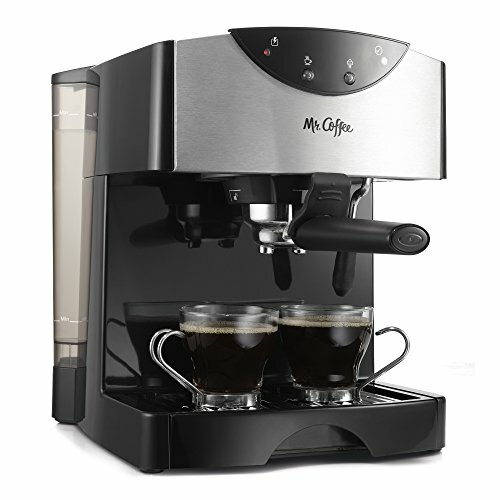 Firstly, while the Mr. Coffee has the advantage of being sold with single and double shot portafilters, allowing extra flexibility in terms of serving size, unlike the De’Longhi, this machine is not compatible with single-use pods (only pre-ground coffee). Larger Water Tank: On the plus side, the removable water tank is slightly larger at 40oz. Also, even though it is compact in design, the Mr. Coffee has height clearance for a standard-size cup, without the need to remove the drip tray or use a demitasse. 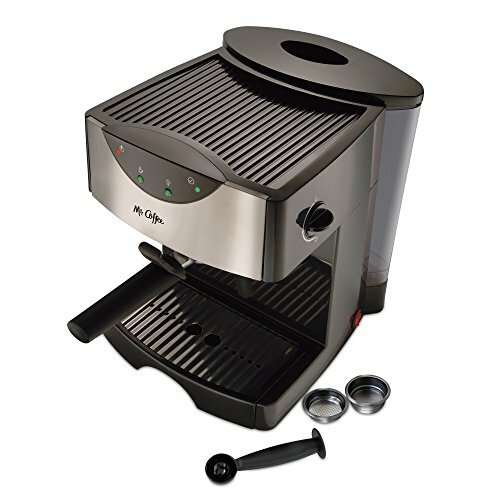 Clean Interface: If anything, the operation of the Mr. Coffee is even simpler than the De’Longhi, with push buttons (for brew, steam, and power) instead of a dial, along with a control knob for the steam wand. The Mr. Coffee is also (arguably) boasts a more handsome design. Again, maintenance requires cleaning the removable parts of the machine and undertaking a descaling process every 40 to 80 brew cycles (depending on water hardness). 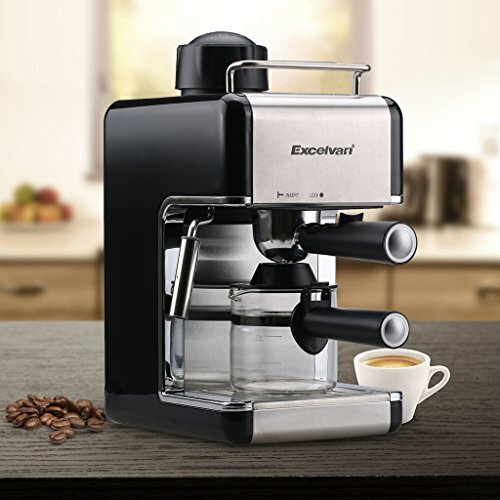 For the third choice, we drop down the price scale for a machine that retails way under the $100 mark, with the Excelvan CM6812 Mini Stainless Steel Coffeemaker Steam Espresso and Cappuccino Maker. This highlights just how affordable and cost-effective brewing espresso-style coffee at home can be (divide $70 by the number of times you visit your local café for a caffeine break!). 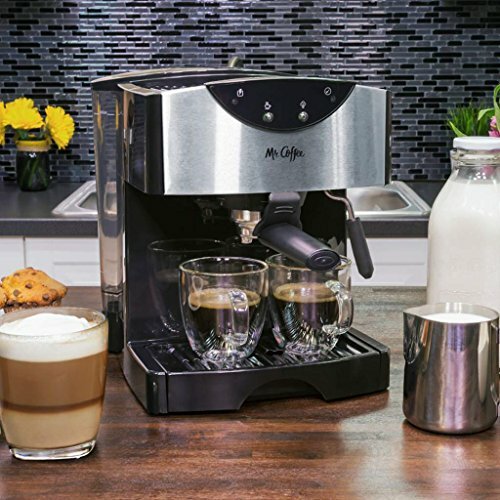 It’s important to note that the features on offer here make this really more of a hybrid espresso machine/coffee maker, offering a versatile and budget option for home brewing. Lower Pressure: The first thing to appreciate, aside from the less-familiar brand name, is the considerably lower 3.5-bar pressure. There’s no escaping the fact that this is low. Optimally extracting espresso requires the water to be forced through the coffee grounds at 9-bar pressure. Takes a Bit Longer and Tastes a Bit Heavier: What does this mean in practice? ‘Espresso’ extracted at 3.5-bar pressure will take longer to come out and will taste heavier than with a higher pressure extraction. In fact, many coffee purists would argue that coffee extracted at 3.5-bar pressure isn’t espresso at all. However, as long as you use a fine grind and a quality bean, the coffee produced by the Excelvan is more than acceptable. 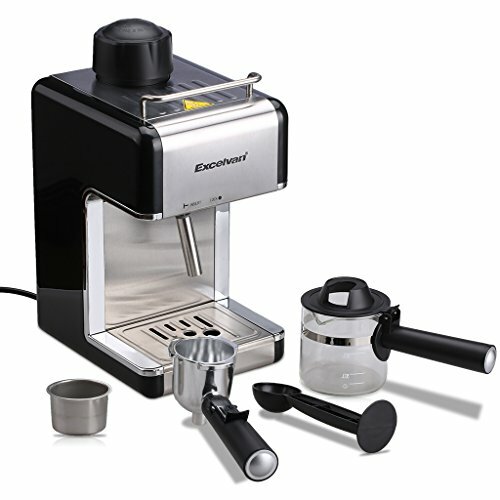 Not for Espresso Purists: If you like to drink straight-up espresso, you might find the Excelvan lacking, but if you want to enjoy Americanos and milky coffee drinks at home, you should be more than satisfied with what this machine can produce. Don’t forget that we’re at the lower end of the budget scale, and this means making compromises with functionality! Comes with Glass Carafe: As with the other machines, the Excelvan features an independent milk frothing wand for steaming milk. 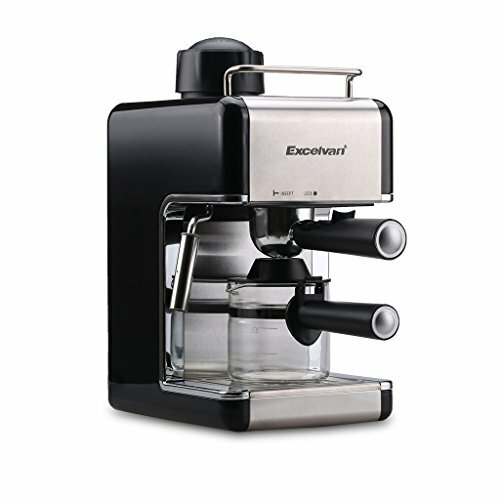 Unlike the other two machines, this one comes with a glass carafe with capacity for up to four cups. Simple Operation: The operation is simple, with a single knob to control the coffee and steam. As before, you will need to purchase the milk pitcher separately and you might wish to replace the supplied tamper with something sturdier. Maintenance is similar to the other two machines. If paying this much for an espresso machine doesn’t immediately make you sad, then go for it. 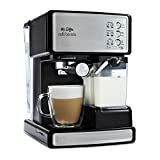 I highly recommend it for it’s functionality, quality-tasting espresso, and because you can watch your milk froth all by itself like you’re some kind of emperor.